Happy Sunday, everyone! I hope everyone’s weekends were enjoyable and snow-filled, like mine (just a casual 20 inches)! I figured I would give you guys a recap on my Valentine’s Day, since my day was probably spent a little differently than most. After a very snowy few days and two unheard of snow days given by Virginia Tech, I was getting a little irritable spending so much time indoors with no way to get around. 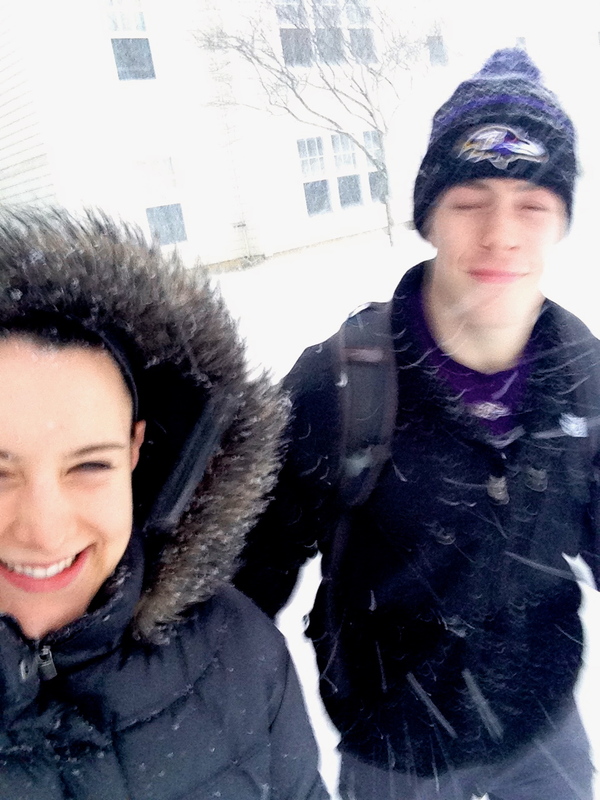 There was some snow trekking and sledding, but there’s only so much you can do outdoors when it’s blizzarding on ya. Naturally, I was even more excited than usual to go to the gym. Two days without working out definitely got to me. Once you’re so used to going everyday, just a little time apart feels like an eternity. First thing in the morning, Ryan and I finally were able to head to the gym for our routine Friday workout, leg day, both of our favorites! I’ve been upping all of my sets, as well as weight little by little. I can tell I’m definitely getting stronger. I’m sure doing legs twice a week helps a great deal too! I thought this was funny and kind of ironic. A little later in the day, after Ryan dug out my snow buried car, we went grocery shopping to pick up some things for our plans to cook dinner together later that evening. 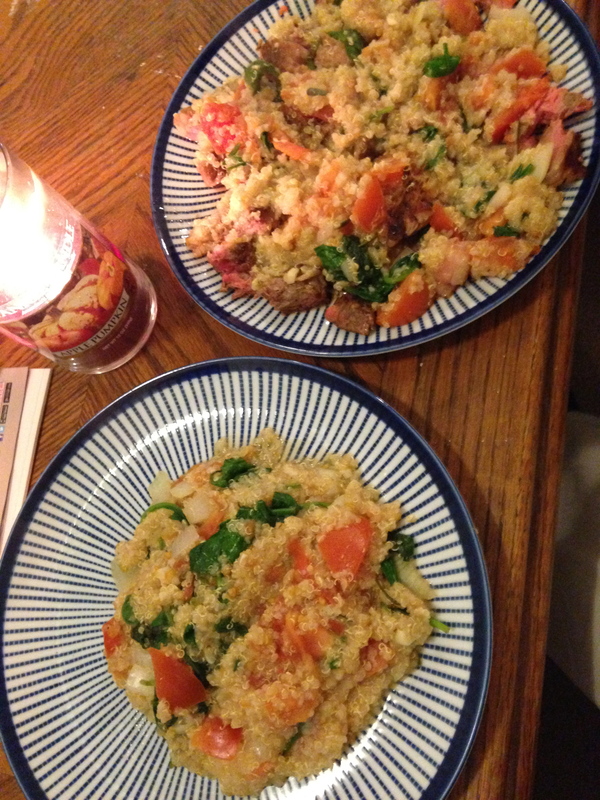 It can get a little complicated when cooking both for a vegan and non-vegan, but after careful deliberation on what dish to cook, we decided on a quinoa stir fry. I decided to go the Italian spicing route, as that tends to always be a favorite of mine. 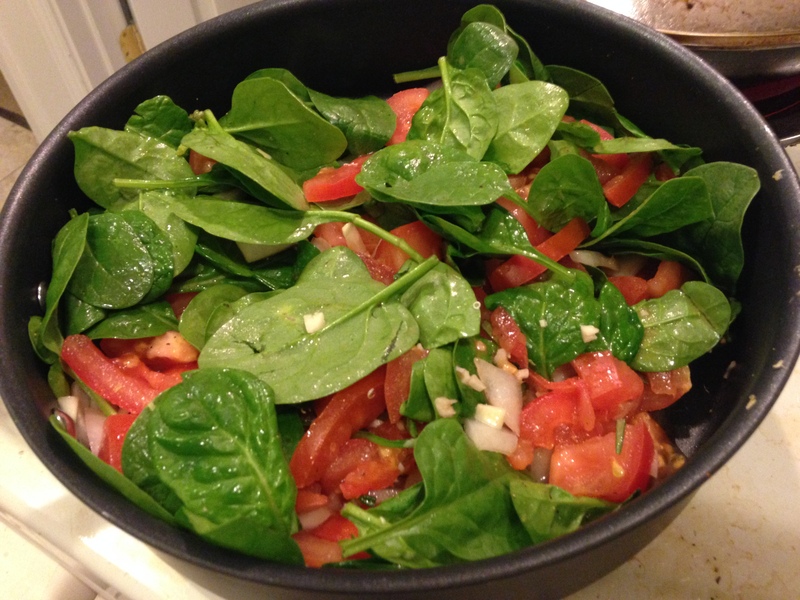 We chopped up tomatoes, onions, and garlic and placed them in a pan with spinach and a drizzle of olive oil, turned it on medium-low and let it cook while the quinoa did the same. 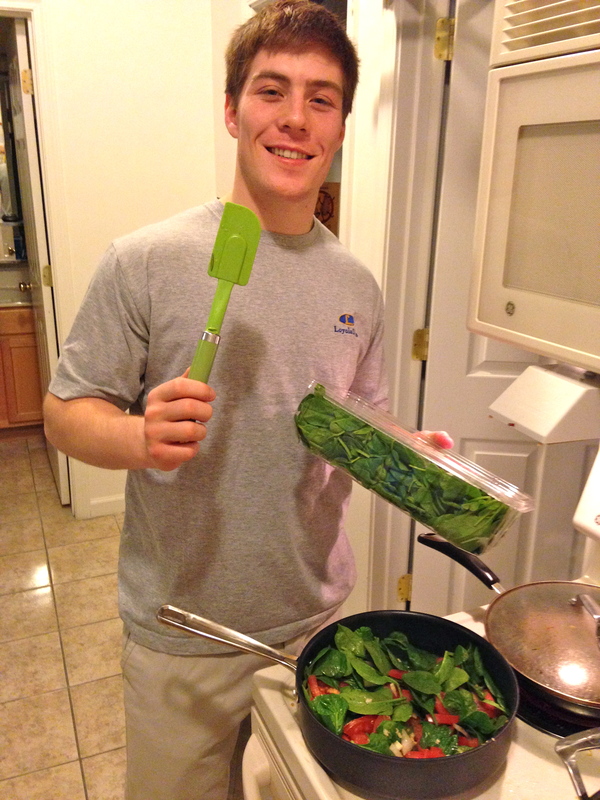 I added in some fresh rosemary and ground black pepper to the mix as well. 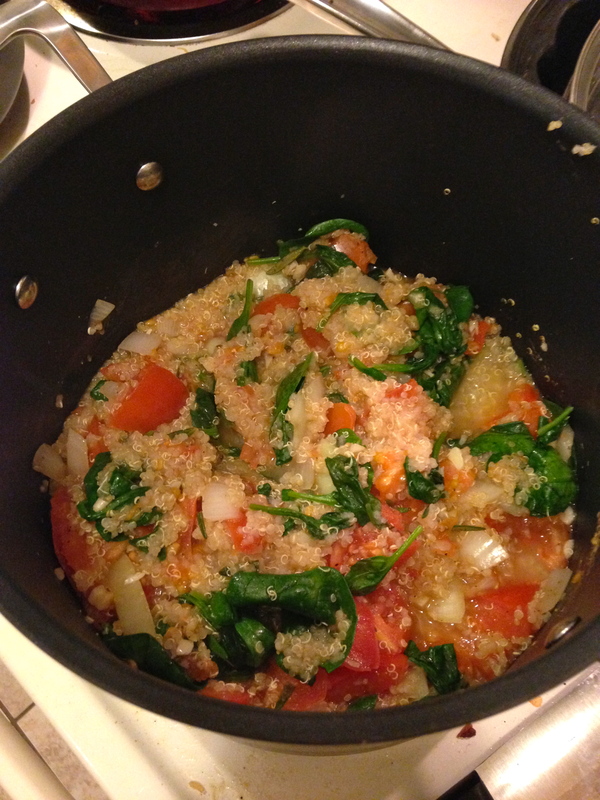 Once both the quinoa and veggies were cooked, we poured the veggies into the quinoa pot and stirred. Ryan asked me to give him a 10 minute countdown before the dish was ready, so he could put on a steak for himself to add to the mix. We both agreed it didn’t really go with the meal, but what can ya do? Boys love their steak. It was a lovely, relaxing night in and with such a delicious, healthy valentine meal that suited both the vegan and non-vegan appetite. Since we didn’t get a cute Valentine pic, here’s one from last night before we headed to one of my sorority sister’s birthday party. 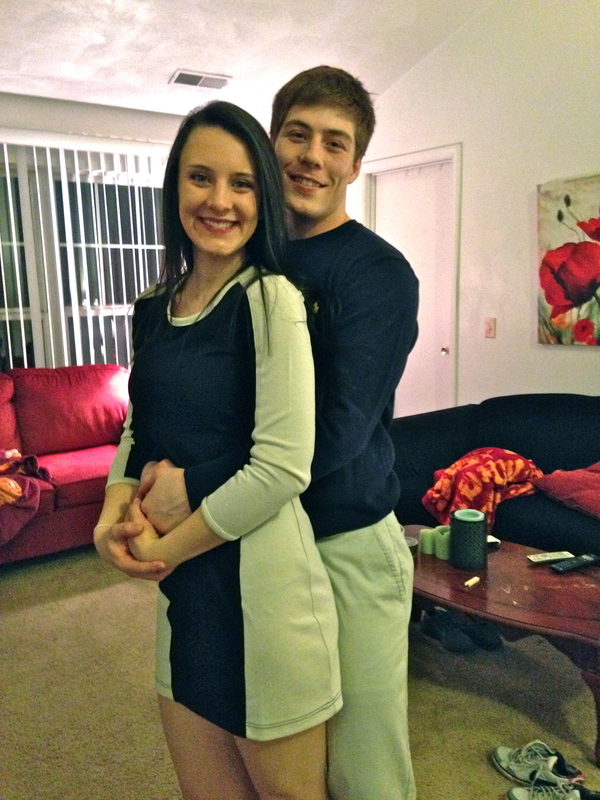 Prom pose of course! Well that’s all for now! I need to get to my studying, as it’s been a lazy Sunday so far. At least I wrote a blog post, right? That’s gotta count for something.